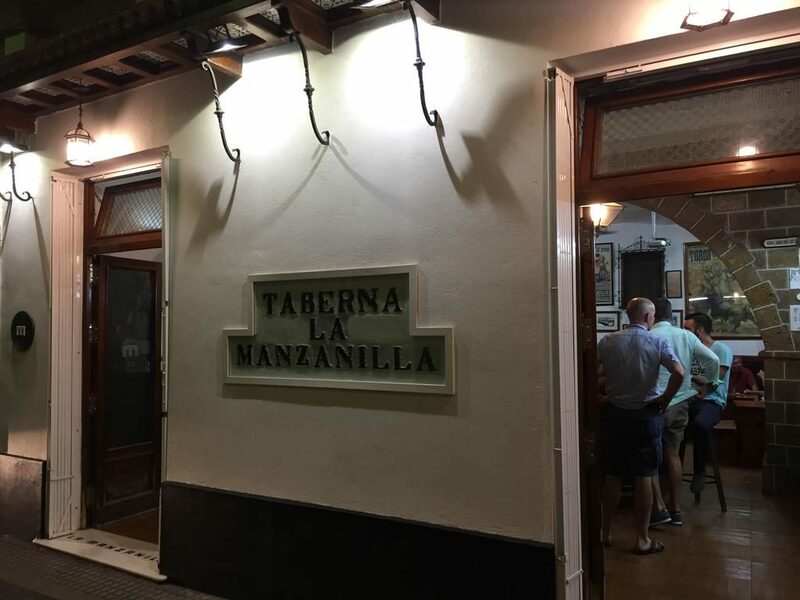 Taberna de la Manzanilla. Two glasses of Sherry and olives. Sherry (Jerez in Spanish) is a fortified wine made from white grapes that are grown near the city of Jerez de la Frontera in Andalusia, Spain. Sherry is produced in a variety of styles made primarily from the Palomino grape. It is one of the most authentic and traditional places you can find in Cadiz, and probably in all Andalusia. It is located in the middle of the Old Town and has all the charming a Spanish “cantina” or “taberna” could have. Its decoration is simple but effective. 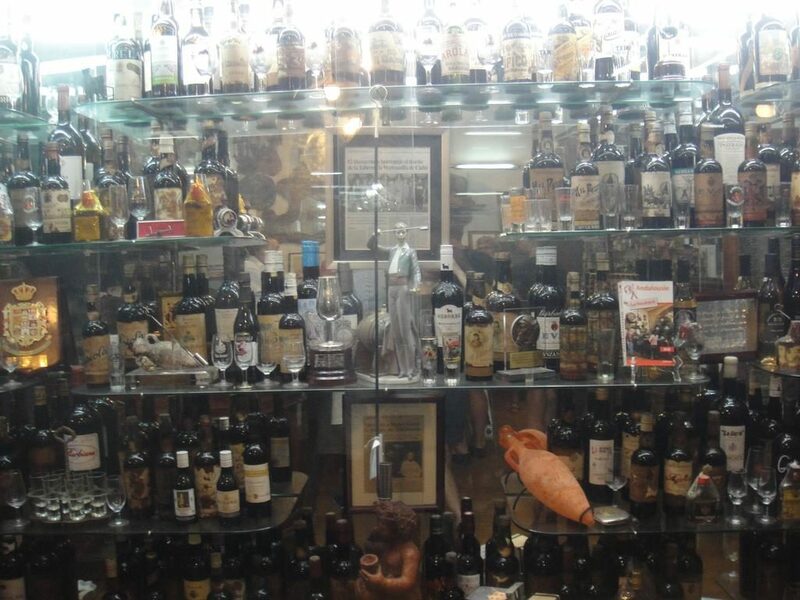 Old bottles in a glass box, a picture of the original owners, and a few bullfighting posters (“toreros Andaluces“). 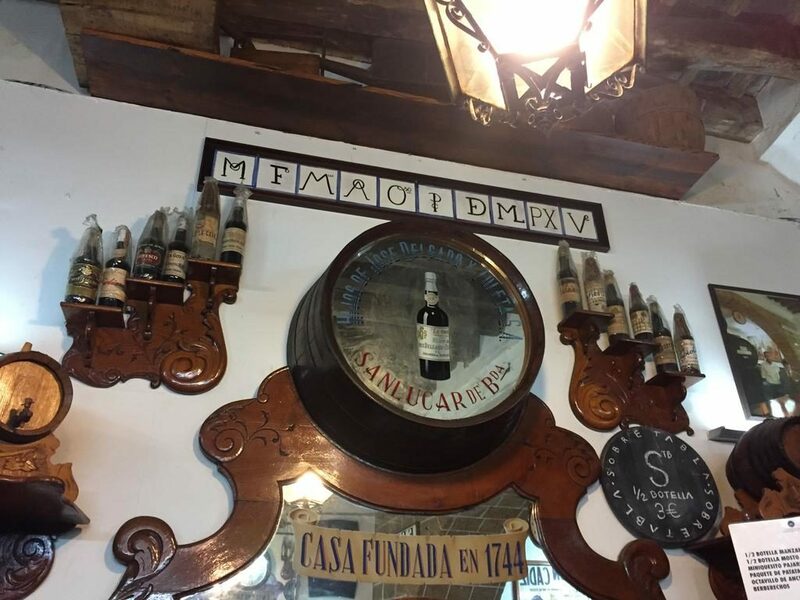 It is an “old-fashioned” “family run” sherry bar, and they don’t serve anything else to drink (beer, spirits, etc), with the exception of Vermouth (“Vermú“). So it really is for people who are serious about sherry. It does not have a lot of space, like most of the places in the old town, but enough for the number of customers they normally have. There are a few tables at the back (behind the main bar) and a small bar opposite to the main one. In my opinion, these are the ones you should try (some of them). 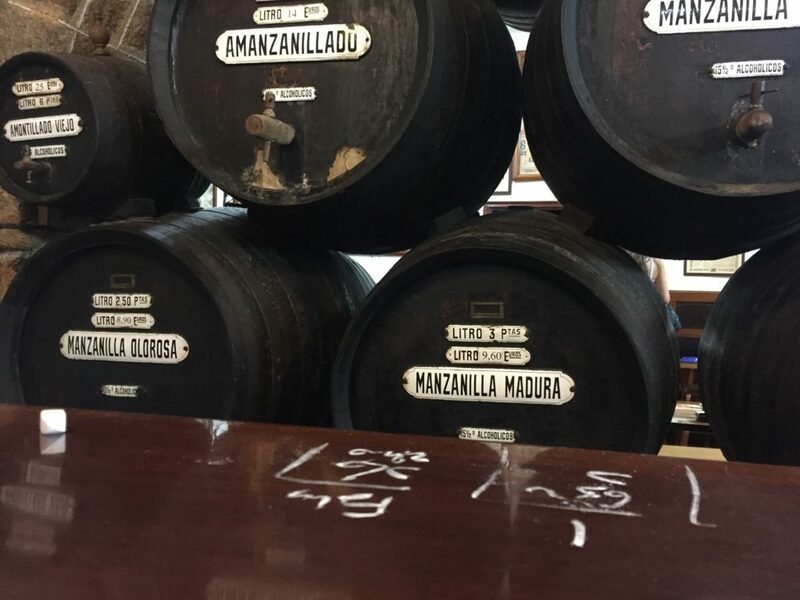 They are meticulously selected from different wineries and fermented cautiously in the same shop, resulting in a delicious sherry that is stored in oak tanks for further “añejamiento“. And for those who like sweeter wines and/or slightly chilled, there is fridge below the bar where a few bottles are ready to be taken and fill glasses. Mosto is also available, which is a non-alcoholic drink made of pressed grapes. It is not allowed to ferment so as to make wine, resulting in a full-bodied grape juice. Once you sit (or stand) next to the bar, which I strongly recommend to do, the real experience begins. Its current owner and barman Jose, alias Pepe, will serve you, offering help and advice. 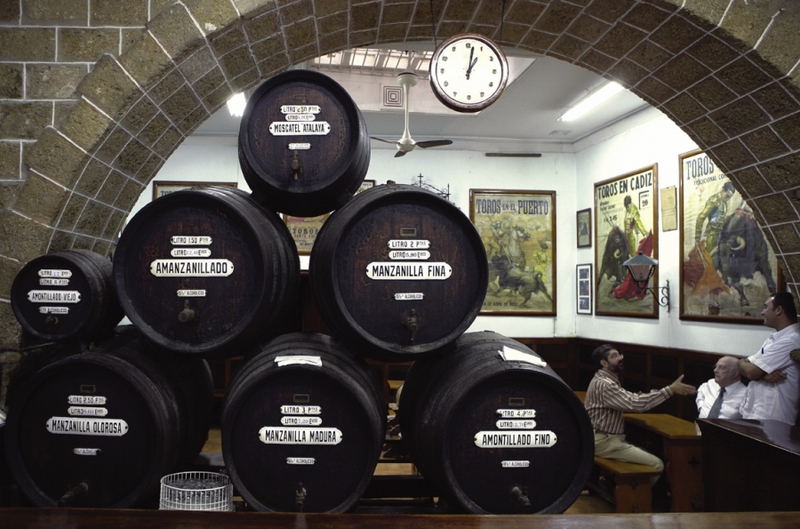 He is the third generation of sherry masters and now runs the “taberna”, which started in 1900 with his grandfather and was continued by Miguel until 1992, when Pepe finally got it. He is wise and the first question will probably be: – “Quieren algo seco o dulce?” (Do you like dry or sweet?). But don’t rush. Pepe is wise and you should take the opportunity to acquire some of his knowledge. A warning here! The key tip for having different types of sherry is clear and simple: you must start with the driest, and move forward to the sweetest, but never in the other way around. -“Es como que te comas el postre y luego te pidas unas gambas” (It would be like ordering shrimps after having the dessert). Pepe made this clear to us in a very serious and respectful way, just after we ordered a Manzanilla (dry) after a Moscatel (one of the sweetest). So we followed his advice, had another sweet one, and promised to come again the next day. 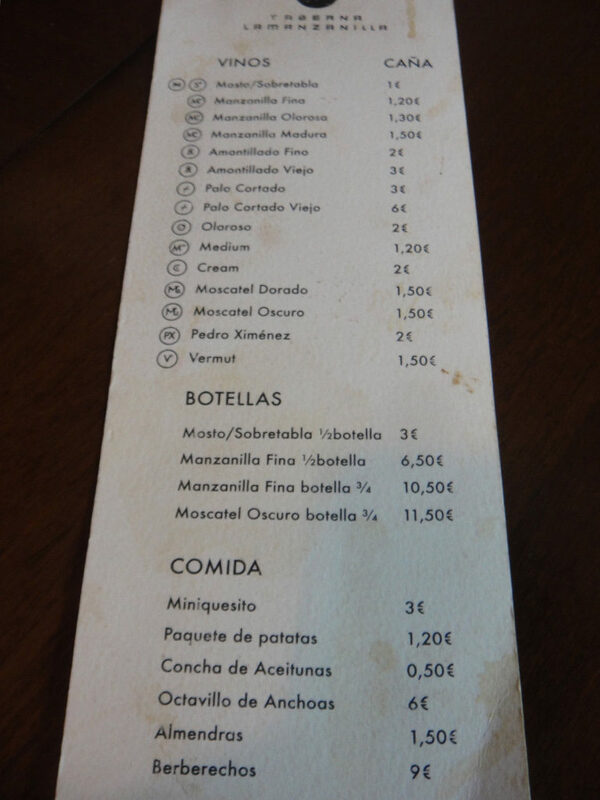 This unwritten rule of sherry order is implied in the menu, where the 14 types of sherry are ordered by sweetness. The full list is the following, which is also shown in the picture below. As you can also see in the picture above, there are also a few nibbles you can order. The “sardinas” (sardines) are quite tasty, which are canned and come with bread. Pepe will open the can for you. Other nibbles are cheese, almonds, crisps and cockles. Additionally, and for free, a tiny pot of delicious green olives are served with your drink. The wine is served in small glasses, similar to ones for tequila shots, although slightly bigger. 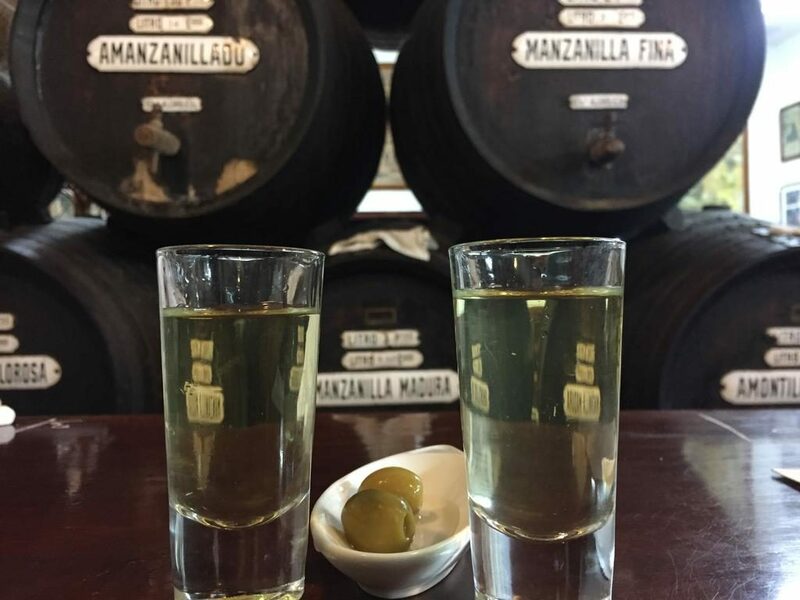 There is also Vermouth, a now trendy drink around Spain, which comes in a different glass and it is not part of the strict ranking of wines, as it is not actually a wine. You can also buy litre bottles and carafes (4, 8 or 16 litres) to take away. And an extra product: vinegar. Another original and authentic detail is how they keep your tab. Your drinks are chalked up on the wooden counter, as shown in the image below. It is opened from 10:00 to 15:00 and from 18:30 a 22:30 during the week; and only in the morning during weekends and public holidays. Finally, a couple of pictures of its decoration.